Rep. Don Turner displays the Republican caucus' priorities Thursday at the Statehouse. Gov. Peter Shumlin has a new friend: House Republicans. As lawmakers negotiate a final tax package to fund state government, the third-term Democrat has voiced strong opposition to several taxes that the House and Senate have approved. On Wednesday, the gov assembled a group of nonprofit executive directors at a Statehouse press conference to take aim at a proposed cap on income tax deductions they say would harm Vermont charities. 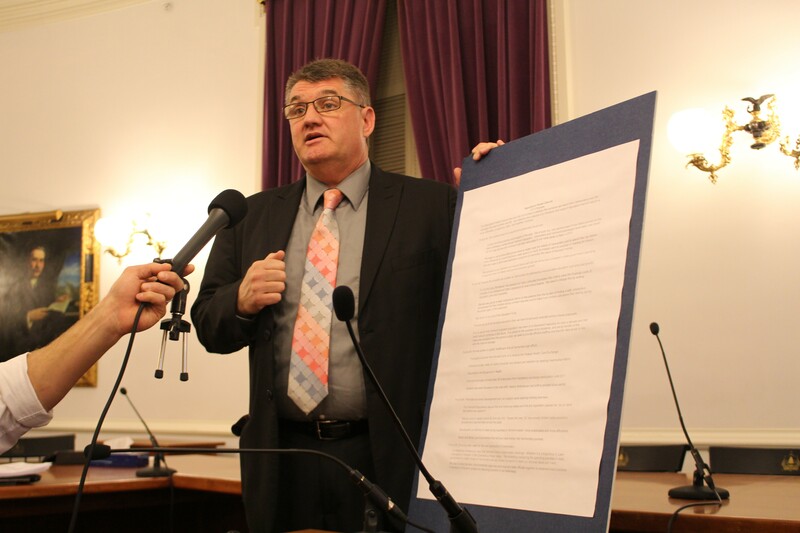 Though Shumlin hasn't said publicly he'd veto a bill that included such tax increases, Senate President Pro Tem John Campbell (D-Windsor) said Wednesday that the governor has dropped the v-word in private. To override a gubernatorial veto, Democrats would have to muster two-thirds majorities in both the House and Senate. But House Republicans said Thursday they would oppose such an override and vote as a block to sustain a Shumlin veto. "If the governor is serious, then we want to make sure that we send a loud and clear message that we're with him or we're not," House Minority Leader Don Turner (R-Milton) said Thursday during a lunchtime caucus meeting at the Statehouse. Turner said he'd gathered his fellow Republicans to make sure they'd "hang together" and support a governor who they often oppose. Republicans hold 53 of the House's 150 seats. Gov. 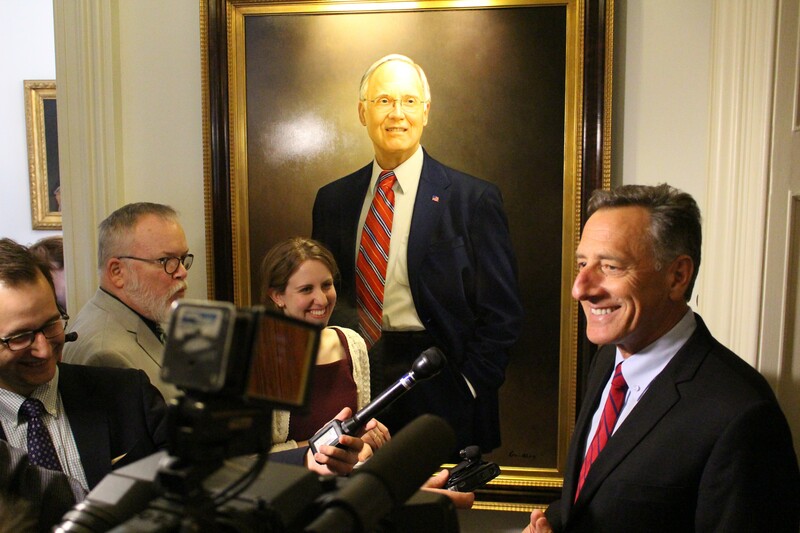 Peter Shumlin speaks with reporters Thursday at the Statehouse. While the majority of Turner's colleagues appeared to support his strategy, some voiced reservations. "Is this going to raise the governor's political capital by saying, 'We'll back you on this budget?'" asked freshman Rep. Joey Purvis (R-Colchester). "We came here to represent our constituents," Turner responded. "I believe that if the governor is doing what our constituents have asked us to do ... then why wouldn't you support this, whatever the political ramifications?" Rep. Kurt Wright (R-Burlington) noted that while Shumlin has recently embraced a more modest tax bill, his original budget was far more expensive than anything either body of the legislature has approved. The House has passed roughly $55 million in new taxes this year. Shumlin's budget included $112.7 million in new taxes. "The governor is out there trumpeting that he's working for the taxpayers of Vermont ... but remember where he started," Wright said. "How do we know he doesn't make a deal with the other side?" Rep. Topper McFaun (R-Barre Town) argued that while campaigning for reelection last fall, he and his colleagues all "heard the same thing: people want their taxes under control." "Therefore, if the governor is coming out that way, I'm more than willing to help him — and us — do what the people have asked us to do." After barely 10 minutes of discussion, the caucus voted unanimously to sustain a veto if it comes. Whether it comes to that remains to be seen. In brief comments outside his ceremonial Statehouse office Thursday afternoon, Shumlin said that while "emotions are high and people are tired," he thought he could reach resolution with legislative leaders. "I'm trying to work together with all sides to come up with a sensible bill," the governor said. House Speaker Shap Smith (D-Morristown) said much the same. "I think it's a little early to start talking about vetoes," he said.